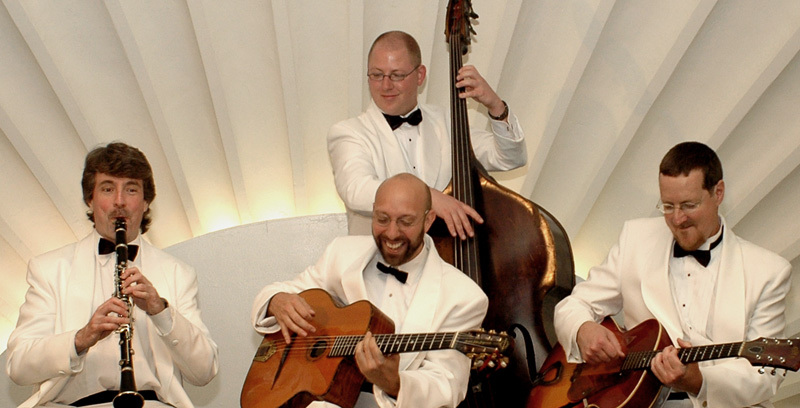 Parlor Showcase: The Zzymzzy Quartet Knows How To Swing! The early weeks of 2014 in San Diego produced extraordinarily warm weather, resembling more the Bard’s A Midsummer Night’s Dream than Simon and Garfunkel’s “A Hazy Shade of Winter.” Such balmy nights can energize the populace, and a Friday night in the busy street of University Avenue in North Park is no exception. A recent Friday evening at the popular Claire de Lune coffeehouse found available seating going quickly. Some patrons were busy figuring out the pieces to an elaborate fantasy board puzzle while others were taking advantage of free wifi. But the group that won the prize in the people-watching category was an assembly of spirited swing dancers doing leg-stretching exercises and tying up shoe laces on the appropriate footwear. For a neighborhood teeming with microbrew bars, it was extraordinary to find the floor space of the all-ages Claire de Lune filled with couples tripping the light fantastic. The energy level of the room was caused by the copacetic sounds of the Zzymzzy Quartet, which for the last decade have won over San Diego seated audiences and dancers alike with their “road less taken” approach to the rare sheet music and arrangements from the eras that provided Gypsy jazz and the Great American Songbook. It’s a seasoned musical troupe featuring Beston Barnett, Pete Miesner, Matt Gill, and Paul Hormick. Their tongue-tying moniker (pronounced zim-zee) may at first impression appear to be the antitheses of the business vying for the first spot (“Aardvark Towing Service, etc.”) in the white pages of the phone book, but Zzymzzy guitarist and vocalist Pete Miesner provided a more plausible explanation involving two eccentric Americans from the 20th Century: Raymond Scott and Walter Winchell. Scott was a composer whose frantic, zany (there’s another “Z” word) music entertained children of all ages when Carl Stalling adapted Scott’s work for Warner Brothers cartoons, home of the famed Looney Tunes series. He preferred to compose by “head arrangements” rather than jotting notes on sheet music and became known as a pioneer in electronic music, creating sounds on instruments and contraptions as diverse as a clavivox, electronium, circle machine, rhythm modulator, and bass-line generator. Scott caught the attention of Winchell, a once powerful newspaper and radio gossip columnist whose rapid fire speaking voice (“Good evening Mr. and Mrs. America, from border to border and coast to coast and all the ships at sea. Let’s go to press.” ) was heard as the narrator on “The Untouchables” TV show. The Zzymzzy Quartet draws from a number of musical influences, but the artist whose inspiration looms large over the band is the great Belgian-born guitarist Django Reinhardt. Cited in most biographies as being a functional illiterate, Reinhardt was a Gypsy who endured several tragedies in his life (including the devastating burning of the fourth and fifth fingers on his left hand, the result of a house fire). The legacy of his recordings with and without violinist Stéphane Grappelli had such a profound impact on Zzymzzy Quartet leader Beston Barnett that he and his wife, Andrea Guerrero, would name their child after the jazz guitarist virtuoso. But as Barnett revealed, Django was just one of his many childhood musical heroes. Raised in Nashville, Barnett musically came of age when most of the kids were absorbed by the “Big Hair ’80s” and MTV videos. “My tastes have always been out of joint with the moment, “ said Barnett. “The first tune I learned on the piano was Thelonious Monk’s “Blue Monk,” age five. Around 13, I figured out how to connect my record player to my alarm clock, and I woke up most school days to either Louis Armstrong singing “Sunny Side of the Street” or Django playing “Tears.” I spent my allowance every week at the Great Escape – a used record store in Nashville – and learned to play piano, bass, guitar, and drums by wearing out all that vinyl. I ate up Reverend Gary Davis and Horace Silver records – a lot of that was my folks’ taste in music, which I just ran backwards with. Backwards in time, I mean. Last month’s issue of the Troubadour featured an article on Miesner’s recent promotion as the Section Supervisor of Art, Music, and Recreation at the new downtown San Diego Library. Not only has the repertoire of the Zzymzzy Quartet expanded due to the discoveries Pete has made in a researching capacity, but it has proven to be personally rewarding for Miesner as his musical odyssey has taken him in interesting directions since his days playing with the Crawdaddys, the Town Criers, and the Tell-Tale Hearts, local San Diego bands that were part of a thriving DIY (Do It Yourself) scene. “ It should be understood that my parents grew up with what is now called the American Songbook, Miesner explained. “My father to this day remembers so many songs that it is hard for me to stump him (I did, however, with Irving Berlin’s “My Walking Stick”). So, when I started playing guitar and listening to my older brothers’ Beatles, Stones, and Yardbirds records, there was also this knowledge of the Big Band Era that I knew from my pop. The big band stuff is all American Songbook [material] and much of it revamped Tin Pan Alley. Also, in the late ’70s as I scoured the city for records, I looked to the stuff that my British R&B favorites were influenced by. This led to 78s of blues greats and jump records like Louis Jordan, Roy Milton, Wynonie Harris as well as earlier [artists] – Jimmie Lunceford, Cab Calloway, Count Basie, Duke. According to Miesner, “this band also opened me up as a singer. I was never looked to as a singer in my other bands. 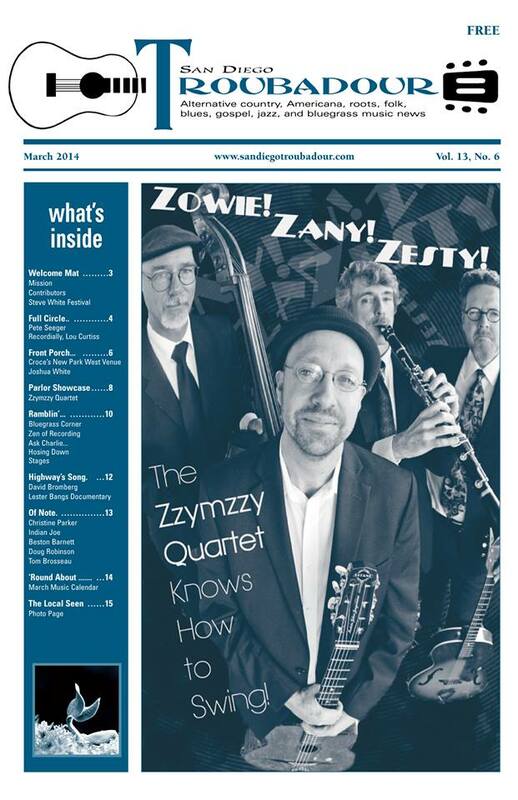 With the Zzymzzys, my role as the primary singer grew naturally – and I have been enjoying it. You add in Matt, traditionally a classical player who knows his way around his instrument and who wants to play jazz, and bass player, Paul, with an impressive wide-ranging resume, and there you have it! I should also give honorable mention to steel player Bruce Doyle – he is kind of our fifth member who subs for both Beston and me. Let’s just say things can get wild when you add a guy on an old tri-cone resonator playing these old jazz standards. Massachusetts native and clarinetist Matt Gill brought an impressive classical music background when he joined Zzymzzy. Gill attended the Oberlin Conservatory of Music (near Cleveland) and played with the Wooster Symphony and the Minneapolis-based Allegro Con Brio Chamber Orchestra. He initially came to San Diego in 1990 to help organize a summer chamber music series and played in local orchestras. What helped him bring out the jazz element to his work was when he had the chance to play with former members of an iconic band best associated with New Year’s Eve, the Guy Lombardo Orchestra. Zzymzzy made a successful transition to a studio CD, not losing any of their exuberant club sound in the process. Entitled Zzwing!, the album was released on Barnett’s Art Hurts label, an outlet for a variety of side projects, including Barnett’s current CD, At the Sligo Fair (reviewed this month), which combines music composed by Barnett with the poetry of Yeats. Patrick Marion was handling the bass duties for the quartet during the sessions for Zzwing! Providing a fuller sound for Zzymzzy on the CD were guest artists Rob Duncan on accordion, Chad Farran on doumbek, Chloe Feoranzo on tenor saxophone, Ray Suen on violin, and Hal Smith on drums. Zzwing! is a celebration of the Great American Songbook with some enticing international compositions as well. It should be noted that Irving Berlin, the most successful American songwriter of the 20th century, has two songs on the CD: “What I’ll Do?” (1923), now so identifiable with F. Scott Fitzgerald and the Jazz Age, and “Let Yourself Go” (1936), introduced by Ginger Rogers in the film Follow the Fleet. “Lover Come Back to Me” (1926) was written by Sigmund Romberg and Oscar Hammerstein II, long before the latter talent would team up with Richard Rodgers and revolutionize the American musical theatre. The life force that was Hoagy Carmichael is heard on “Judy” (1938), written by Carmichael and Sammy Lerner; and the songwriting trio of Jimmy Campbell, Reg Connelly and Ted Shapiro team up for “If I Had You” (1928). There are over 350 known versions of “Caravan” (1937), written by Juan Tozol, Duke Ellington, and Irving Mills. Although there were lyrics written for the seductive melody, “Caravan” is probably better known as an instrumental, covered by Les Paul, Chet Atkins, the Ventures, and two giants of exotica: Martin Denny and Arthur Lyman. “The World Is Waiting for the Sunrise” (1919), with lyrics by actor Gene Lockhart (father of June “Lost in Space” Lockhart) and music by Ernest Seitz, was revitalized by Les Paul and Mary Ford in a groundbreaking multi-tracked performance. Zzymzzy will be blowing out the candles on their tenth anniversary cake in a big way. On Friday, March 21, the quartet will present “When Django Met Duke,” a salute to the historic 1946 U.S. tour, which featured the mutual admiration billing of Reinhardt and Ellington. Barnett reflected on the remarkable collaboration of two jazz giants. “I think that somewhere between the sound of Django and the sound of Duke is exactly where I’d like the Zzymzzy Quartet to be. Django was quick, mischievous, primitive, singular, precise, and exotic with his acoustic guitar, like a French fox lurking in an alley with a dirk. The Duke was elegant, melodic, nostalgic, bluesy, complex, showmanly, and favored velvety horns and ensembles; he was more like a royal lion in disguise who goes to the dance halls of the commoners and ends up giving himself away by holding his cigarette just so and buying everyone drinks. For better or worse, I’m kind of in charge of bringing that Gypsy thang to the band and Matt’s job on clarinet is to provide the antidote for all that clanging Django with a softer melodic Ellingtonian touch. “I don’t think we’re just another “Gypsy jazz” band, but neither do I think we are a simple “trad jazz” combo,” said Barnett. “I aim us at somewhere between France and the States – doing the standard Gypsy numbers but also singing the American Songbook. The contrast between Django Reinhardt and Duke Ellington [and their meeting] captures that nicely I think. Perhaps the final word for this article should emanate from where it started: the dance floor. Julia Hall McMahon, an active member in San Diego’s swing dance community, explained why the band has such a devoted following. “Around 2006 or so, I was shopping at OB People’s Coop, when I saw my old friend Pete Miesner playing with his combo “Speakeasy” in the upstairs deli. I was instantly mesmerized and excited to hear them playing up-tempo hot jazz like no band I had ever seen! My husband and I were planning our wedding at the time, and we instantly hired them as our wedding band. From the Woggles garage rock to Zzymzzy Quartet’s 1920s ‘hot jazz,’ five standout performances highlight an active music scene. Jazz fans will want to check out the Zzymzzy Quartet, appearing at Claire de Lune on June 26. Featuring guitarists Beston Barnett and Pete Miesner, upright bassist Patrick Marion and clarinetist Matt Gill, the group is an aural time warp, performing 1920’s-styled “hot jazz,” mixing Django Reinhardt guitar stylings and Benny Goodman’s big band swing. With an encyclopedic knowledge of vintage tunes and the virtuoso chops to play them, the Zzymzzy Quartet’s sound is both danceable and a lot of fun.